Andi Buyung Saputra, Kajang leader, left, with President Joko Widodo. 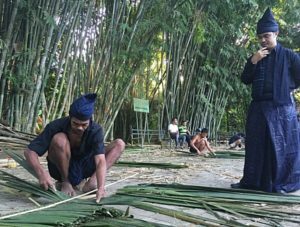 President Joko Widodo has bestowed the right to manage customary forests on nine indigenous communities, heralding the end of decades of uncertainty and the beginning of a new era of secure right to land. Under the CGIAR Research Program on Forests, Trees and Agroforestry, the World Agroforestry Centre and Global Affairs Canada have helped one community regain control of their forests. Participants included representatives of the Kajang leadership and other community members, village and sub-district government staff, members of the district’s Forestry Agency and Tourism and Culture Agency, the Legal Bureau of Bulukumba, and several NGOs, such as Aliansi Masyarakat Adat Nusantara South Sulawesi and Balang. ‘Working together with the Bulukumba District government, we were all able to change the process of developing regulations from exclusive to inclusive’, explained Agus Mulyana, senior governance researcher with AgFor partner the Centre for International Forestry Research. ‘We all opened the door to understanding and creating stronger regulations. Our collaborative effort lead to the emergence of the Bulukumba District Decree no. 760/VII/2013 regarding the Formulating Team for the Draft District Regulation for Recognition of Customary People in Bulukumba. Today’s presidential decree is a nice “year-end gift” for everyone’s hard work during a long process’. That process started with forming a consultative team made up of representatives of all the interested parties, to support the drafting of the regulation to ensure it met everyone’s needs. AgFor partner Balang conducted various studies, such as a stakeholder analysis, categorization of tenure, classification of formal and informal access rights, cataloguing of forest policies, and consideration of the various cultural practices. These studies provided important information to the many people who needed to be included in what was described by those involved as a ‘robust’ participative approach to drafting a complex regulation. ‘An important next step will be providing the community with the knowledge, skills and resources to enhance their management to ensure that their forests remain assets for future generations’, said Roshetko. Moira Moeliono, AgFor senior scientist with the Centre for International Forestry Research, agreed, commenting that, ‘The district regulation is not the end of the work but rather the beginning of a long journey to improve forest management and indigenous rights. After the promulgation of the district regulation and recognition by the presidential decree, everyone needs to continue to move forward to resolve other matters, particularly, regulations need to be created that link management of the customary forests to watershed management and strengthening the indigenous institutions’. 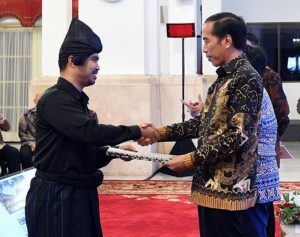 The recognition of the right of indigenous people to manage forests by the Indonesian Government is an important step in agrarian reform as part of the Nawa Cita, Widodo’s program of nine main strategies to address long-term problems afflicting rural communities, such as poverty, inequality and lack of paid employment. Widodo also pointed out that transferring management of customary forests to indigenous people was a small part of Indonesia’s social forestry program that wants to bring 12.7 million hectares under community management.